AMT ELECTRONICS M1 LEGEND AMP SERIES JCM800. The M1 Legend Amp Series pedal, back to the roots of rock, with classic gain as the JCM-800*. Vintage Marshall* style distortion in compact pedal form. Capture all the tones of one of the most respected, popular guitar amplifiers in rock history. 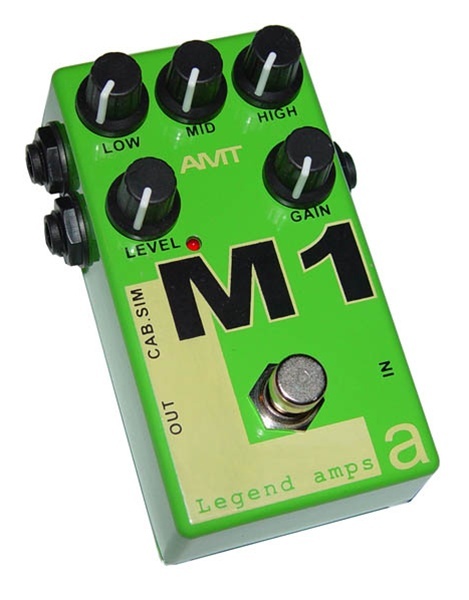 The M1 will open up your sound pallate and playing options without having to spend thousands of dollars on a new rig. - The AMT Legend Amp Series guitar pedals provide excellent dynamics, nuances, and characteristics similar to that of tube driven amplifiers. - Tube-like range of volume control provides great sound density, playability, and power when playing at full volume and also in conjunction with your guitars volume knob. - TRUE BYPASS. The preamps of the Legend Amp Series pedals use passive true bypass circuitry, therefore no loss of guitar signal is noticed in your pedal chain. Similar to if no pedal was there at all when bypassed. - Features high level of output signal (+10dB in extreme position of Level knob) corresponds to the output levels similar of tube preamps. Thus, you have adjustable signal level allowing to hook up your preamp AND direct input of a power amplifier. - Controls include LEVEL, GAIN, LOW, MID, and HIGH. - TWO signal outputs: DIRECT AMPLIFIER OUT for guitar amplifier use and CAB SIMULATION OUT for mixer, or studio use. AMT Electronics Legend Amp Series, the NEW STANDARD of Heavy Guitar Tone.